Match Report - Penn & Tylers Green Development 3 - 3 Long Crendon FC. Long Crendon fought out a thrilling 3-3 draw with Penn & Tylers Green Development, coming from two goals down to preserve their 13 game unbeaten run and remain top of the league. Manager Ryan Davis was forced into one change, Ben Sykes replacing the unavailable Billy Lane, meaning James Hawkes could be freed to play in a more familiar forward role. The first half was a largely cagey affair, with little sign of the fireworks that were to come. Crendon, however, produced the one moment of quality to see them lead going into half time. 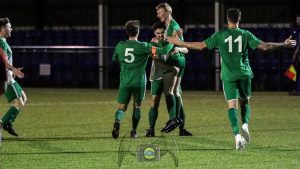 Great work rate from Harry Pettingell saw him start a move in midfield, the ball was funnelled out to the left through Scott Chappell and Dino Bonwick exchanged passes with Hawkes before drilling an unstoppable shot across the Penn keeper and into the top corner. Probably the best team goal of the season and enough to give the side the half time advantage. What had been a game of few chances, with Crendon looking composed, exploded into life disastrously for the away side at the beginning of the second half. First, Konnor Saunders capitalised on hesitation from Nathan Brownsword to nip in and get the equaliser. Two minutes later and the game was turned on its head as calamitous Crendon defending at the back post saw the ball drop to Rashid Hamid and he fired home to put Crendon in front. Archie Pettingell was sent on to replace Scott Chappell but before he could get into the game, it was 3-1 to Penn. Daniel Sharp was allowed an age to line up a shot from distance and his dipping effort went over George Collingwood and sent the Penn fans into raptures. It was time for Crendon to go for broke now and Christian Warwick was thrown on at right back. Almost immediately he began to rampage forward down the right and his combination with Harry Pettingell started to trouble the Penn defence. On 72 minutes, Archie Pettingell powered through a couple of challenges and fired into the top corner from 20 yards, a brilliant strike. Suddenly it was all Crendon with Asher Yearwood absolutely dominating the Crendon midfield and Warwick producing some devilishly quick feet and wicked crosses from the right. From one such move, the ball found its way to Hawkes at the back post but he blazed over a great chance. Crendon weren’t to be denied, though. Yearwood strode forward yet again and after linking with Warwick, he powered in the equaliser. The last ten minutes were virtually basketball with both sides flooding forward. Yearwood almost produced a carbon copy goal but this time his shot hit the post, while at the other end a counter attack saw the Penn substitute Tom Stables screwed his shot wide when in a great position. Deep into injury time Crendon had one last chance, a Penn clearance rebounded off the referee of all things and set Harry Pettingell free but he shot over, just as it looked like the turnaround might be completed. And so, an exhausting game came to a close, with both sides wondering whether to be pleased or disappointed. Ultimately the draw hurts Penn more than Crendon, who remain top but with the gap narrowed to two points by Langley winning at Chalvey. With four games to go, it now looks a two horse race between Crendon and Langley and could be set to go right to the last game between the two sides. Team: Collingwood, B Sykes (Warwick), Bonwick, T Lethbridge, A Farley (c), Brownsword, Chappell (A Pettingell), H Pettingell, Hawkes, Yearwood, O Lethbridge. Goals: Bonwick, A Pettingell, Yearwood. This week Crendon move on to the Berks & Bucks Intermediate Cup final against Buckingham Athletic Development at Wallingford, as they attempt to win it for the first time in their history. Kick off is 3pm. Final score: Long Crendon 4 (James Hawkes 2, Oli Lethbridge, Nathan Brownsword) Great Horwood 0.